Greek authorities are studying what is being described as a cache of “highly incriminating” photographic material in which members of the far-right Golden Dawn party are allegedly depicted participating in mock executions, posing with weaponry and giving Nazi salutes. The hoard of almost 14,000 pictures and 900 video clips – discovered in computers and mobiles phones confiscated from two MPs and a man who headed one of the group’s local branches – has been handed by police to a public prosecutor investigating the extremists’ alleged illegal activities. “What this confirms, without a shadow of doubt, is that Golden Dawn is not only a Nazi group but a criminal organisation that operated as a paramilitary structure,” said Dimitris Psarras, the country’s leading authority on the party. Among them, he said, was Giorgos Roupakias, the self-professed killer of Pavlos Fyssas, a leftwing rapper whose murder in September spurred the Greek government to scrutinise what remains the country’s third biggest political force. 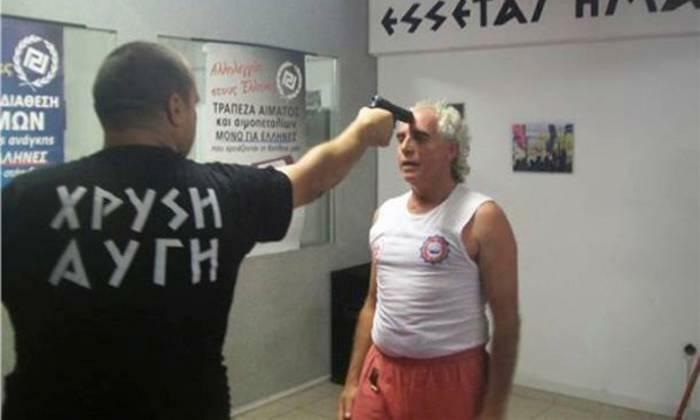 Golden Dawn had previously denied any association with the 46-year-old , who stabbed the musician in the heart and chest after being called to the scene of a fight between followers of the neo-fascist party and leftists in a working-class Athens suburb. In the wake of the government crackdown, the party had also rejected suggestions that it subscribed to the dogma of neo-Nazism. The archive, backed by similar evidence in the private computers of other politicians, including the organisation’s imprisoned leader, Nikos Michaloliakos, has triggered widespread disbelief. Although somewhat inured to the high drama that has enveloped their country since its near economic collapse in 2010, Greeks have been shocked by the sheer scale of the hoard and the lighthearted nature of many of the images. Some portray female supporters in bed brandishing handguns, while others show men posing with swords and assault rifles. Children, presumably encouraged by parents, are also seen raising their hands in Nazi salutes. Six of Golden Dawn’s 18 MPs have been imprisoned pending trial in a crackdown during which riot police have stormed the party’s offices, raided MPs’ homes and rounded up supporters. Three other deputies, including the party’s press spokesman Ilias Kasidiaris, also face charges of using the party to operate a criminal organisation with the intent of demolishing democratic institutions in Greece. Last month, the Greek parliament, the scene of often raucous debate since the election of the extremists in June 2012, voted to cut off annual state funds of around €800,000 (£660,000) to which the party would have been entitled as of this year. As they were led to jail this week, after extensive cross-examining, three of the lawmakers hurled abuse at reporters, shouting that Golden Dawn was a “legitimate force” elected by democratic process. A GPO poll released for a Greek media outlet on Thursday showed that, far from being diminished, Golden Dawn was still garnering support of around 11% – almost four times higher than the popularity of the socialist Pasok, the junior partner in Greece’s fagile ruling coalition. Last week the ultra-nationalists vowed to challenge the government crackdown in the European court of human rights despite the party’s open contempt for the EU. Attending a press conference to announce the move, Nick Griffin, the leader of the British National party, said the clampdown against his “patriot comrades” had been motivated purely by Golden Dawn’s meteoric rise in the polls. On Friday, the far-right group announced it had set in motion plans to sue three senior judicial officials overseeing the investigation into their alleged illegal activity for “breach of duty”. The officials were accused of being “instruments of anti-Greek power” by the party, which claimed they had failed to properly follow the law in their haste to jail its lawmakers, not least Golden Dawn’s enigmatic leader, Nikos Michaloliakos.